Apple (AAPL) may be ready to think inside the box -- the television box, that is. One of the juiciest nuggets in Walter Isaacson's authorized Steve Jobs biography is that the iconic tech visionary was working on an actual Apple-branded television as one of his final projects at the company. 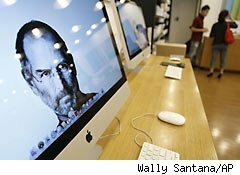 "I'd like to create an integrated television set that is completely easy to use," Jobs told Isaacson. "It would be seamlessly synced with all of your devices and with iCloud." "It will have the simplest user interface you could imagine. I finally cracked it." Professional Apple watchers have been speculating on Apple's evolutionary move into flat-screen televisions for a long time. "Apple's fantastic ability to create exceptionally user-friendly products could revolutionize TVs just like the iPhone changed the mobile phone market," Piper Jaffray analyst Gene Munster said more than two years ago. Ticonderoga Securities analyst Brian White and VentureBeat's Dylan Tweney have continued to add perspective to the speculative fire. In a note to clients six months ago, White suggested that the Cupertino tech giant may have a Web-tethered television on the market as early as this holiday shopping season. That obviously isn't going to happen, but an analyst doesn't go out on that kind of limb unless he has pretty good sources indicating that a full-blown big-ticket television set is in the works. Connected bloggers -- including Tweney -- began throwing out a 2012 release date this summer. However, now that even Jobs is -- or rather sadly was -- publicly discussing an integrated TV that's easy to use, it really becomes a matter of time before Apple makes it official. Don't confuse this with Apple TV, the small set-top gadget that's been a rare dud in Apple's arsenal. We're talking actual smart televisions. Google (GOOG) hasn't had a lot of success with the Google TV platform it introduced last year, but the search engine giant rushed that initiative to the market. Apple will have time to get it right. When Jobs told Isaacson that he finally "cracked" it, he wasn't talking about cracking the screen. Apple's television should be able to stream your owned content backed up on Apple's new iCloud storage solution. There will naturally be apps and access to the prevailing streaming services. Google TV has apps, but developers will finally get serious about developing for Apple. In other words, even without trying, Apple will raise the bar. Apple wouldn't be the first computer company to have dreams of becoming a TV star. Dell (DELL) and Hewlett-Packard (HPQ) rolled out branded flat screens a couple of years ago. Why not? PC monitors continue to get bigger, and the line is blurred between large flat-screen PC monitors and small flat-screen LCD and plasma TVs. Consumers didn't take to Dell and HP as the centerpiece of their home theater systems. HP in particular was just ahead of its time in introducing its Web-surfing MediaSmart line five years ago. However, neither of those two box-smiths have the brand panache of Apple, which can get folks camping outside its stores overnight to become the earliest of the early adopters. Traditional manufacturers will tell you that making televisions is a cutthroat business with meager margins, but that's obviously not going to dissuade Apple. Its brand alone commands a market premium, giving it a markup advantage that has turned commodity gadgetry -- MP3 players, smartphones, laptops, and tablets -- into juicy profit centers. Now that Jobs has gone public with his new vision for television, it will be hard for Apple to resist its introduction. If and when it hits the market, it will be Jobs' baby -- his youngest and final child. And it will be a big hit, at least initially. A lot can happen between yesterday's dream and tomorrow's reality. Several decades ago, Walt Disney discussed EPCOT on his weekly television show. His Experimental Prototype Community of Tomorrow was a planned city, with actual residents and self-sustaining operations. The EPCOT amusement park that opened in Florida many years after his passing bears no resemblance to his original vision. This won't happen here. For starters, the gap between Jobs' words and the actual rollout will be substantially shorter. Apple also has no reason to deviate from the proven formula, and having $81.6 billion in cash and marketable securities gives the company the freedom to once again dream out loud. The Apple television is coming. Start lining up and thanking Jobs. Longtime Motley Fool contributor Rick Munarriz does not own shares in any of the stocks in this article, except for HP. The Motley Fool owns shares of Google and Apple. Motley Fool newsletter services have recommended buying shares of Apple, Google, and Dell. Motley Fool newsletter services have recommended creating a bull call spread position in Apple.